The lethality of inhalation anthrax, combined with the ability of the lethal payload to be delivered in the spore form, has made anthrax an attractive candidate for weaponization. In addition, a vaccine to anthrax does exist, but is not yet widely available. Thus, troops can be vaccinated against the disease while the general population of the enemy remains unprotected. Many of these characteristics that make anthrax a desirable military weapon also make the disease a desirable weapon of the terrorist. As of 2003, intelligence sources indicate that at least 17 nations around the globe have offensive biological weapons programs. How many of these nations are pursuing anthrax weaponization is unknown. The government of Iraq, however, admitted in 1995 to producing over 8,000 liters of concentrated anthrax as part of the nation's biological weapons program. Additionally, only a few generations ago, nations such as Britain and the United States actively engaged in anthrax weaponization programs. Members of an EPA and United States Coast Guard cleanup crew prepare to enter the American Media Inc. office building in Boca Raton, Florida, where at least two people contracted anthrax through a deliberately contaminated letter mailed to the facility in October, 2001.
combined with the use of antibiotic and supportive therapies offer the best chance of survival once an inhalation anthrax infection has been established. A major factor that contributes to the spread of anthrax is the ability of the bacterium to form a spore. The spore is a tough shell that houses the genetic material of the microbe, and can preserve this material almost indefinitely through harsh environmental conditions that would kill the growing bacteria. When conditions become more hospitable—as when the spores are breathed into the warm and moist environment of the lungs—the spores "germinate" and bacterial growth resumes. Most biological warfare experts concur that the manufacture of sufficient quantities of anthrax spores to permit an aerial assault or to form the payload of missiles requires manufacturing facilities and skilled personnel, and is a formidable challenge. Nonetheless, given time, funding and desire, an organization can muster the necessary resources. For example, the terrorist group Aum Shinrikyo, which was responsible for the release of Sarin gas in a Tokyo, Japan, subway station in 1995, also released spores of Bacillus anthracis and Clostridium botulinum (the bacterium that causes botulism) throughout Tokyo on at least eight occasions. The dispersal of anthrax via a crop dusting plane or a balloon is the most likely scenario for the mass exposure of a population. More traditional methods use missiles to deliver the payload of explosives. However, the heat that develops in a missile during its passage to the target, particularly as it re-enters the atmosphere, could kill even anthrax spores. The most popular anthrax weapon to date has been the dried form of the bacterial spores. The powdery material becomes dispersed in the air very easily. For example, opening a letter can disperse the powder and cause spores to be inhaled. In contrast, the process of manufacturing the spore powder is technically complex. When anthrax bacteria for spores and the spores are harvested, they form a sticky paste with the consistency of peanut butter. When this paste is dried, the result is a hard block of material. The block can be ground into a powder. But the spores will tend to have a surface charge and so will tend to clump together. The clumping can be overcome by coating the spores with chemicals such as silica or alumina clay. The Iraqi program utilized a clay preparation called bentonite. For the spores to be inhaled deep into the lungs, each spore needs to be on the order of one to five micrometers in diameter. Anything smaller than this will behave as a gas, and so will be exhaled, while larger particles such as the clumps of spores will become stuck in the upper respiratory tract, where it is more difficult to establish the disease. Preparation of a spore powder where all the particles are the requisite size is not, in terms of difficulty, a trivial task. Nonetheless, the success of the anthrax terrorist attacks in the U.S. in 2001 shows that it is possible. Studies on Gruinard Island—an island off the coast of Scotland where Britain conducted tests of anthrax spore delivery systems during World War II—has recovered spores that can germinate into disease causing bacteria even decades later. Thus, even an inefficient application of anthrax spores may leave a residual that will be capable of infecting people for long after the attack. Heyman, D.A., J. Achterberg, and J. Laszlo. 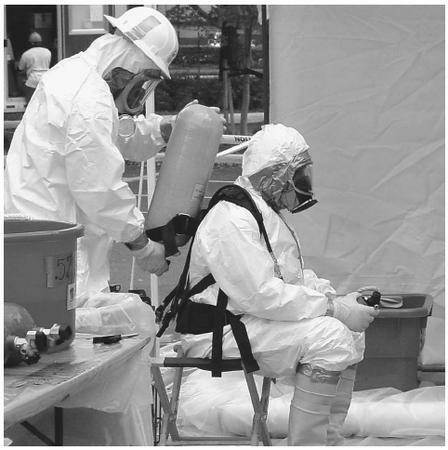 Lessons from the Anthrax Attacks: Implications for U.S. Bioterrorism Preparedness: A Report on a National Forum on Biodefense. Washington, DC: Center for Strategic and International Studies, 2002. University of California at Los Angeles. "Anthrax as a Weapon." College of Letters and Science. February, 2002. < http://www.college.ucla.edu/webproject/micro12/m12webnotes/anthraxweapon html > (29 December 2002).